So cost cutting and closures are National’s plans for public education. That’s not the whole story, however. When it comes to charter schools, National and Act’s joint vision for a “private-public partnership” model – in other words, for an attack on public education – then there is plenty of money to go around. Five charter schools were established over the summer 2013-2014. Already this has been a debacle. Far from being “cost-effective,” as Labour MP Chris Hipkins highlights, students in charter schools receive some $19,664 in funding compared to a state school student who receives $7000 on average. Charter schools involve handouts and subsidies to private providers at the expense of public schooling. National’s priorities are made clear. What was Parata’s response to Hipkins revelations? “Smaller schools cost us more,” she stated. 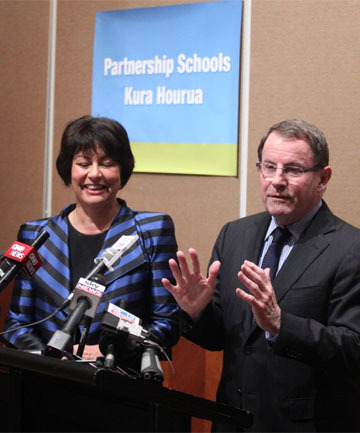 It’s clear that Parata has no objection to smaller charter schools. When it comes to a public school attended by working-class kids in post-quake Christchurch, however, it’s another matter. More galling still, one newly-opened charter school in Whangarei has had to subcontract specialist subjects to local secondary schools because they cannot provide suitable teaching for their students. This is after these charter schools receive more funding than their state school counterparts! Teachers in the region, backed by their union PPTA, have quite rightly refused to prop up charter schools and have insisted that they will not teach charter school students. Far from charter schools offering better outcomes for students who cannot adapt to mainstream schools, research from overseas indicates that students in charter schools perform slightly worse than their peers in state schools. The US has had charter schools for more than a decade now, and there is no measurable improvement in overall performance in literary, maths and science. Charter schools, in effect, are an attack on publicly-funded accessible education. As the PPTA suggests, these schools are the “stalking horse for full privatisation of the New Zealand education system”. Charter schools amount to a transfer of public funds into private education, an attempt to de-professionalise teaching – and so an attack on teachers’ conditions – and a move to try and weaken the teachers’ unions. NZEI and PPTA have been two of the staunchest advocates of public education over the last decades: it is no wonder that National has them in their sights.